Home › White Papers › Part 5: How to assess the performance of your Lead Nurturing efforts in the life sciences. In this issue, I explore the evolution of lead nurturing activities in the life sciences. I’ll begin by examining an all-too-common scenario that highlights the need for lead nurturing. And then I’ll be discussing the big change that occurred in lead nurturing’s recent past; then I’ll look at what the future could (and should) hold for lead nurturing within your own life science organization. To make this discussion more tangible, I’ll provide access to a tool that will help you assess the performance of your lead nurturing activities. Given the results of this assessment, you’ll be better able to guide the evolution of your lead nurturing activities in the life sciences. Imagine the perfect life science prospect showing up—with just one hitch. Let’s imagine that you meet a prospect at a life science trade show. They’d be a perfect client—the organization is the right size, and their needs match perfectly with what you offer. The person you meet is the primary decision maker. You discuss your “minimum level of engagement” to determine the approximate size of the project and learn that the purchase will be a significant one. In other words, this is a well-qualified prospect and “all systems are green.” But during your discussion you ask enough questions to reveal that there’s just one problem: the prospect isn’t ready to buy right now. In fact, they won’t be ready to buy for a year, maybe 18 months. Your job? To navigate this opportunity to a successful conclusion. It will only come to fruition in the long term; there’s no type or amount of activity that will close the deal right now. They’re just not ready to buy. So what do you do? If your life science organization’s lead nurturing processes are not well established, this situation is problematic If your life science organization’s lead nurturing processes are not well established, this situation is problematic for your team. If your sales and marketing functions aren’t coordinating well, then no one really wants to (or is ready to) take responsibility for this situation. Your sales people rely on their commissions, so they have more important things to do—specifically, helping prospects that are ready to buy right now. Your sales managers are watching the numbers for this quarter and maybe the next; they’re not really concentrating on a year and a half from now. Your marketing team doesn’t even know this prospect exists; they’re not on your list of contacts in your CRM, and it’s only by chance that they walked up to your booth at this particular show. Who should be handling these types of situations? If your life science lead nurturing program is well established, this is a piece of cake. You enter the name as an opportunity into your CRM, and the pre-programmed workflows in your marketing automation system take over, sending the prospect a series of emails offering access to unique insight that addresses their life science challenges. Each call to action is compellingly written (and the frequency of these emails isn’t so high that they get annoying). Because you’re sending them insights on a regular basis—insights they can’t get anywhere else—they’ll become used to contact from you. You track their behavior, knowing that as they get closer to making a purchase decision, they’ll be more likely to click on your emails and sign up for your webinars. In this scenario, your marketing function is responsible for building a relationship with this prospect, one that allows you to build trust and guide their transition from one stages in the buying cycle to the next. That is, your marketing function is responsible for nurturing this lead. Which all leads to the big question: Is your life science marketing team ready to handle these types of opportunities? Do they have the resources to nurture these prospects? The shifting nature of lead nurturing in the life sciences. Do your sales and marketing staff perform the same duties in the same way as they did 10 years ago? The answer is, “No.” (If you answered, “Yes,” either you were 10 years ahead of your time a decade ago, or you are 10 years behind the times now.) The duties of your sales and marketing teams have shifted in very important ways. One of the most significant shifts in the sales and marketing landscape is in the nurturing of prospects. The timing of this shift is difficult to pin down (and quite frankly, some life science organizations still haven’t gone through it). The shift in lead nurturing began with the advent of email and the internet, gained momentum through content marketing, and became well entrenched through the rise of marketing automation. Lead nurturing has shifted in three important ways: how it’s done, who’s responsible and what activities it’s comprised of..
As a reminder: lead nurturing is the process of building a relationship with your life science prospects, one that allows you to guide their transition from one stage in the buying cycle to another. Regardless of when the shift began, lead nurturing has shifted in three important ways: how it’s done, who’s responsible and what activities it’s comprised of, as shown in figure 1. Manual, sales, conversation: It used to be that nurturing was largely a manual affair, relying on follow-up through individual phone calls made by salespeople. Automated, marketing, content: Now, high-performance nurturing is largely an automated affair, built around unique, insightful content created and distributed by the marketing team through a marketing automation program. In other words, the process of building a relationship with our prospects has shifted, from manual to automated, from sales to marketing and from conversation to content. 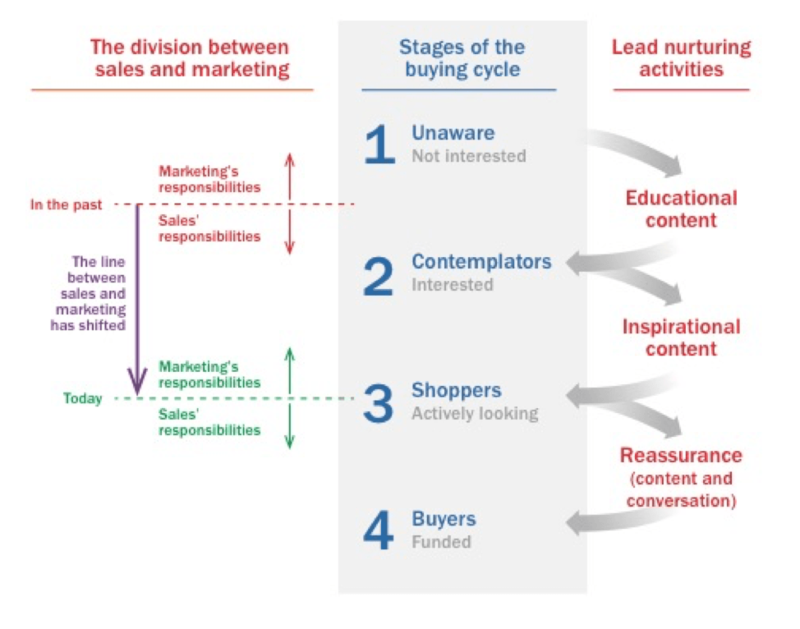 Figure 1: For most lead nurturing in the life sciences, across all phases of the buying cycle, the required activities have shifted from conversations led by the sales department to content distributed by the marketing department. The shifting line between sales and marketing in the life sciences. 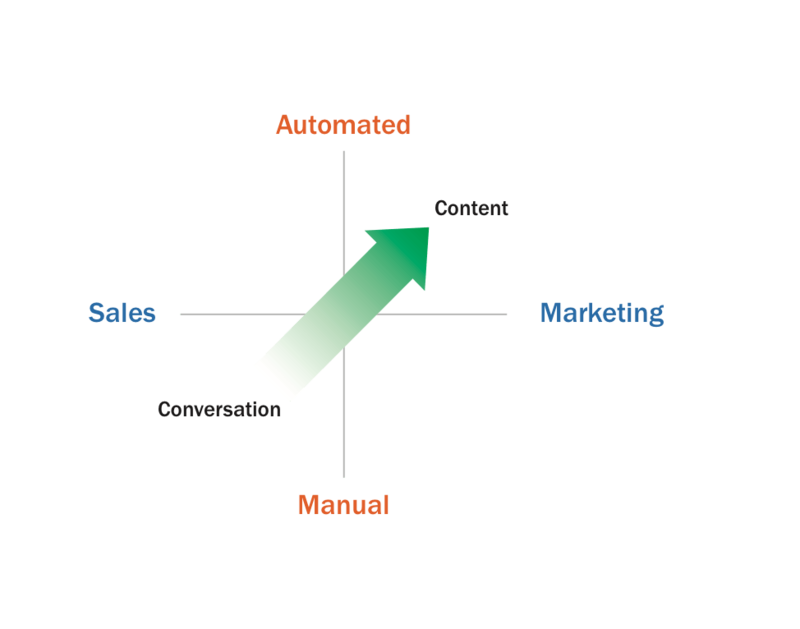 The line between sales and marketing has shifted, as shown in figure 2. One of the big shifts captured in this diagram is the changing nature of responsibility. Nurturing prospects who were in stage 2 (Contemplators) and in many cases stage 3 (Shoppers who were not ready to buy right now) used to be the responsibility of sales; now it belongs to marketing. This is actually a significant advance, because it gives you the opportunity to dramatically improve your lead nurturing and take better care of your life science prospects. Figure 2: As buyers progress through the different stages in the buying cycle, the types of support they need shifts. Technology has enabled the line between sales and marketing to shift, freeing sales to focus on late-stage opportunities and pushing responsibility to nurture prospects to it’s proper home: the marketing function. The Minimum Level of Readiness. In selling services, we can use a “Minimum Level of Engagement” (MLOE) as a tool to qualify our prospects and determine their expectations for the total dollar value of the purchase. We use the MLOE as a target, a suggested minimum price of the service we expect a client (of reasonable size) to buy. The MLOE enables us to discuss money early and thereby helps weed out prospects that won’t be a good fit for our life science organization. I’d like to propose a similar concept in lead nurturing: the “Minimum Level of Readiness” (MLOR). Life science prospects send out signals all the time about their position in the buying cycle and their readiness to move from one stage of the cycle to another. At a certain point they’ll be ready to begin a serious sales conversation. At car dealerships, salesmen have been trained to determine your Level of Readiness by asking one simple question, “Are you ready to buy a car today?” Buyers below the Minimum Level of Readiness answer, “No.” Buyers above the Minimum Level of Readiness answer, “No, but…” or “Well, perhaps if…” The answer helps determine the salesperson’s next steps. In the life sciences, crossing the threshold of the Minimum Level of Readiness typically happens during the transition from stage 2 (Contemplators with interest) to stage 3 (Shoppers with Intent). The Level of Readiness can be determined by asking questions during sales conversations, but if an organization has gone through the shift described in Figure 2—so that lead nurturing is handled automatically rather than through individual conversations—the Level of Readiness must be determined by other behaviors. This is where the lead scoring activities offered by Marketing Automation systems prove to be so handy. You can read more about lead scoring here. Where are you in the evolution of nurturing your life science prospects? As I discussed in the last issue, a high-performance lead nurturing ecosystem has eight main activities. Seven of them form a cycle, and the eighth is one way that life science prospects are attracted to and enter the process. This cycle is shown in figure 3. 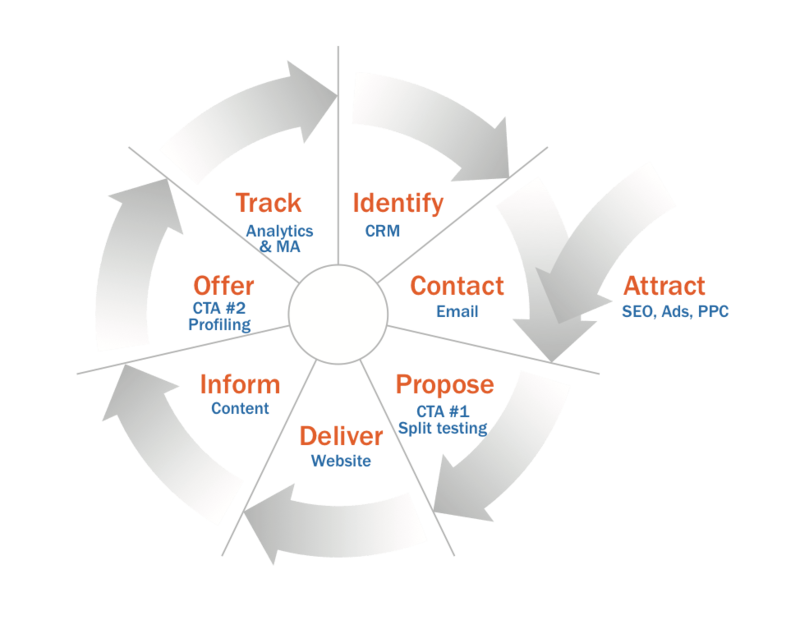 Figure 3: The lead nurturing cycle in the life sciences. There are eight activities in the cycle. Read more about this cycle here. A brief review of the stages of lead nurturing in the life sciences. Life science organizations tend to follow a predictable path in the evolution of their lead nurturing activities. I’ll briefly describe the main stages here; if you want more information you can read more in the previous issue. Stage 1: In the first stage of evolution, lead nurturing is rudimentary. Organizations in this stage rely more on sales than on marketing efforts. There is little thought leadership, only promotional content, so little actual nurturing can occur beyond what a salesperson can accomplish manually on the phone or with individual emails. Stage 2: This stage is characterized by the use of basic technology to identify, attract and track prospects (primarily: a CRM, SEO and Google analytics). But this stage typically is focused only on technological improvements; there is still no compelling thought leadership, so routine lead nurturing is largely limited to manual processes aimed at one individual prospect at a time. Stage 3: The effectiveness of lead nurturing shifts dramatically when a life science organization’s focus turns to the creation of unique life science content. The presence of this content means that organizations can offer real value to a prospect in exchange for some attention (and some personal information). 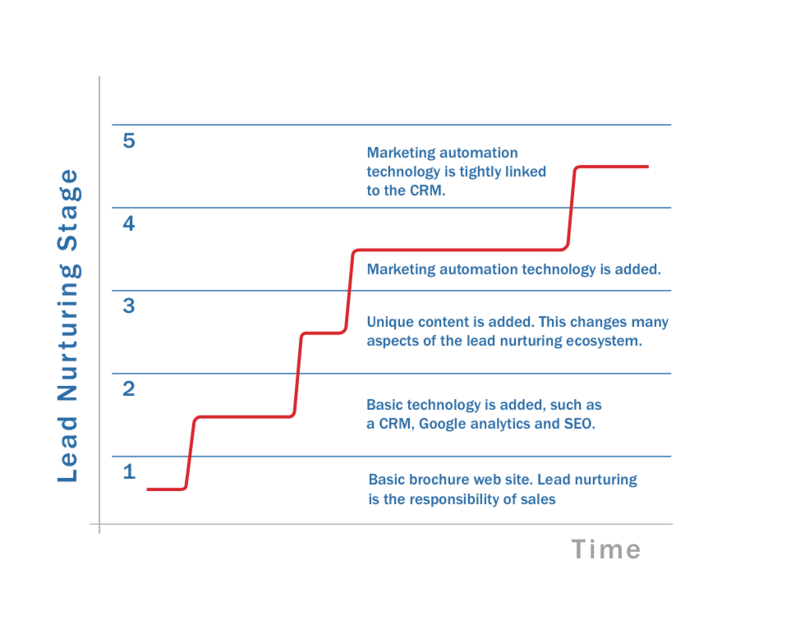 Stage 4: As content creation becomes routine, marketing automation technology is harnessed to optimize lead nurturing efforts. Workflows are established to automatically pull contacts from the CRM and send them unique insight. Stage 5: The integration between the CRM and marketing automation becomes very tight, allowing life science organizations in this stage to track and score the behavior of individual visitors to the web site. Drip campaigns can customize the resulting response, nurturing clients closer to a buying decision. Life science organizations evolve from one stage of lead nurturing to another. The evolution of lead nurturing activities in the life sciences is episodic. Life science organizations tend to evolve from one stage of lead nurturing to another. They don’t do so gradually; their progress tends to be episodic. As shown in figure 4, they’ll remain in one stage for quite some time, and then an “inciting incident” spurs an upgrade in one of the eight activities—which often result in upgrades to other activities as well. Figure 4: Organizations tend to migrate from one stage to another in predictable ways. They tend to remain in a stable configuration for quite a while, while the transition between stages happens relatively quickly. Offer: the offer can now be based on the promise of additional insight. Figure 5: Organizations tend to migrate from one stable configuration to another. Shown here is a typical migration from stage 2 to stage 3. For additional information about the makeup of each stage, read more here. How sophisticated is your life science lead nurturing? An assessment. How do you know what level of sophistication you’ve reached in your lead nurturing and therefore what to work on next? Use the following assessment to find out. You can read through the assessment here, but to make your score easier to compute, I’ve limited the number of questions to three. If you want a more complete view of your lead nurturing performance, take the assessment online. You’ll have access to more questions so you can examine your lead nurturing efforts more closely, and you’ll receive additional, tailored suggestions for improving your efforts. To take the assessment, choose the answer that best matches your current lead nurturing activities. Please describe the system you use to keep track of life science prospects; select the most appropriate choice from the options listed below. A. The tracking of contacts is rudimentary. It might consist of a stack of business cards, a spreadsheet, a simple database or a simple CRM. Most of this work of identifying prospects happens “manually,” that is, a marketing or sales person will identify individuals or very small groups of individuals that should be contacted. B. We have a CRM and standards for its use are in place. Most of the work of identifying prospects still happens “manually,” that is, a marketing or sales person will identify individuals or very small groups of individuals that should be contacted. C. Our CRM is linked to our Marketing Automation (MA) system. Prospects’ behavior is tracked by the MA system, and results are recorded in our CRM. D. Our CRM is tightly linked to our Marketing Automation system. Prospects’ behavior is tracked and scored; behavior is classified and this determines what type of contact happens next, and when. Please describe the state of your content for nurturing life science prospects. E. There is no compelling educational content. What content exists is sales-focused. F. We create compelling thought leadership. This is not just duplicative, run-of-the-mill content, but offers unique insight that is valued by the audience. Our content creation could be more consistent. G. We create compelling thought leadership. This is not just duplicative, run-of-the-mill content, but offers unique insight. Content is created on a consistent, ongoing basis, month after month. H. Compelling thought leadership is created. This is not just duplicative, run-of-the-mill content, but offers unique insight. It comes from a content team that is well staffed, well-funded and well resourced. Content is created on a consistent, ongoing basis, month after month. It is reused and repurposed in multiple fashions, across multiple channels, including social media. Please describe how you track the behavior of your life science prospects. I. Few, if any, web site analytics are enabled on our site. J. Basic Google analytics are enabled on our web site. K. In addition to analytics, a full marketing automation system is linked to our CRM, which tracks and scores the behavior of individual visitors. L. In addition to analytics, a full marketing automation system is linked to a CRM. This tracks and scores the behavior of individual visitors. Workflows are established to nurture different classes or types of prospects. Scoring your life science lead nurturing assessment. Using the table above, add your individual scores for each question. Then divide your total by 6 and round your score to the nearest whole integer. Your final score should represent the (approximate) lead nurturing stage of your organization, from 1 to 5. These stages are described briefly above, but if for more details about the individual stages and the progression between stages, see our last issue. Interpreting your scores and focusing on the future of your life science lead nurturing. Remember, this is a limited assessment based on three questions; it is only a simple diagnostic. To draw a medical analogy, this is a Body Mass Index, not a CAT scan. These three questions probe the three most important aspects of any lead nurturing program: your CRM system (for keeping track of prospects), your unique, insightful Content (for attracting and educating prospects) and your Marketing Automation system (for contacting prospects and tracking and scoring their behavior). If you’re not currently using a CRM, begin by implementing a basic CRM. Establish standards for its use. Begin to plan a process to create compelling content. Work with your IT team to establish basic Google analytics on your web site. Establish a process for creating compelling content. This is the single most important step you can take. You’ll need to provide the proper resources to your content creation team, including people, money and time. You can read more about creating compelling content here. Implement a Marketing Automation system, to harness the most value from the compelling content you’re creating. Link your Marketing Automation system to your CRM and track and score the behavior of individual visitors to your web site. Ensure that you’re creating a steady stream of compelling content. Build workflows to nurture separate classes of prospects, based on specific behaviors as well as input from the sales team. Make sure you’re reusing and repurposing your content. If your score is a 5, you should take a vacation, or focus on something else besides lead nurturing. Congratulations. Nurturing in the life sciences has changed significantly in the past decade. As more technology has enabled the automation of marketing functions, the dividing line between sales and marketing has shifted. Nurturing early stage prospects should no longer be the responsibility of sales, but of marketing. As organizations increase their level of nurturing effectiveness, they tend to do so in “quanta”—that is, they progress rapidly to the next stage and stay there until some “inciting incident” spurs the move to the next level. Consequently, we can determine what a typical organization should focus on to advance to the next level of lead nurturing. In my next issue, I’ll conclude our series on lead nurturing. © 2016 Forma Life Science Marketing, Inc. All rights reserved. No part of this document may be reproduced or transmitted without obtaining written permission from Forma Life Science Marketing.